I love where my mother came from, Castleconnor in Enniscrone. I go up there very often, to the house that they were all born in. Their house was in Castletown in Castleconnor but the house was deserted for years and then a man bought the farm – it was a very small farm. The man who bought it has re-roofed it and he holds hay in it. I go into the house – the keys are hanging around it and I would get the keys and go in – illegally, you know – because he didn’t know for a long time – but when I used to go in and remember how it used to be and the old fireplace – part of it is still there and the wall over it is white and I put my name on it in Irish. I often go up there and go into it then into Enniscrone. I have relations there. (My father’s story and photograph formed part of a great exhibition called ‘From The Feet Up’ in the Hawk’s Well Theatre in Sligo. The stories were collected by Maura Gilligan and each story-teller was photographed by James Fraher. Now this explains much. You are certainly a chip off the old block--in so many respects. I loved his way of telling it - the syntax so favoured by the Irish ("I was down the town of Sligo") It has intrisic rhyme and rhythm, doesn't it? It was just grand! (And so is the photograph). Fascinating phraseology. Nice story too. Did you get photos of the house? Would be nice to have a few pictures of that fireplace and the house itself before it falls apart. I love the old houses (as you probably noticed by now). I seldom see photos of old places from Ireland, only castles which are really old but they make me wonder about the houses, the smaller places. I laughed! What a coincidence they found each other like that. It's a superb portrait btw. But posting it on your blog has me thinking of Dorian Grey (is this a photo of Ken and he's aging backwards?? LOL) You two are a great pair. My mother and I are the same; if I live into my 70s I know exactly what I'll look like. Your father is a handsome Ken. And he has the same witty style of recounting his story. This post reminds me of what I plan to do with the book. I just hope you could send me a photo of yours just like this one? Hope: He does indeed spin a yarn or two. Thanks. Kat: Even I was impressed by the syntax, seeing it written down like that. I guess the story was extracted piecemeal from a conversation but it's very well done. Certainly I can read the piece and make sense of every inflection. Jim: Yes the phraseology does stand out. It's interesting that you could hear this told without remarking too much on that but writing it down brings it right to the fore. Rene: If you met us both on the street, you would probably find we are strikingly similar in many respects. The picture if more formal than he normally is but it captures something which is in him but which might not normally be seen. Laura: I haven't got picture of the house! And I've been over there myself once or twice. It's a tiny tiny cottage. Jena: Thank you. I'll pass that on to him, he will doubtless want to come and visit you. I'm afraid I don't have any pictures of myself of this quality and I am now increasingly camera-shy. The photographer who took Dad's one is a very talented man, I think it shows. The photo in my post links to more of his work. Castlecronner? So, are you descended from Irish royalty? Good story, but most impressive is the character written in your father's face. Enjoyed the post. Laura: I will. Or at least find a pic of a similar house, I have lots on file, I think. Dave: Thank you. The photographer is a talented guy and his other stuff of worth a look too. 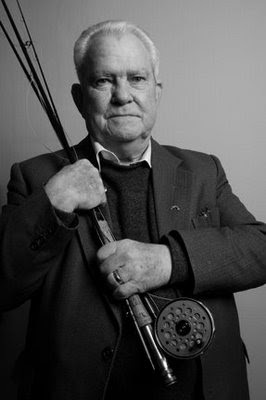 My dad was most uncomfortable about the pic - he is an accomplished fly fisherman and would never hold a rod like that but yet the picture, as you rightly say, captures something. I agree with Dave K. - the picture is a story in itself - colour digital photos just don't do that. That is such a lovely story. I like to listen to my mother telling stories of the old days and I to like to visit the area where she was born. We have lived in Enniscrone for over 20 years. Its funny how the local Gard was able to get a hold of you like that, you dont remember his name do you? That's great. I love it. Reminds me of my Dad telling me stories, he only tells them when I don't ask or we go past something he remembers or a thing knocks something loose in his head and it spills out his mouth. Wonderful account Ken, brings back happy memories of Uncle Eddie recalling this at family gatherings at Della & Jims's in recent years. You are remarkably like your Dad in his younger days, handsome good looks run in the family.